A prohibition of the abuse of dominance is an essential provision in any country's competition law. The purpose of such a prohibition is to protect competition where it is potentially weakened by the presence of dominant market players. If applied immoderately, however, this prohibition is liable to seriously harm competition rather than protect it. 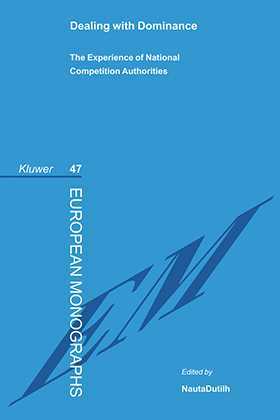 In this useful compilation, local practitioners and academics in twelve countries provide a detailed summary and analysis of the application of their countries' law in this area, drawing on the experience of national competition authorities in dealing with market dominance as well as a wide range of legislation, administrative regulations, and case law. Nine EU member states are covered, as are Australia, New Zealand, and the United States. Although contributors were specifically asked not to compare their national provisions with Article 82 EC, the book nevertheless provides useful insight on that article, as well. National "borderline cases", of the kind described here, help to clarify the application of Article 82 EC, especially considering that the case law on this provision is often controversial. Dealing with Dominance is a useful reference tool for the application of the national counterparts to Article 82 EC in Europe and beyond and answers a basic practical need of both national and international competition law practitioners. This book can also be seen as an especially important contribution to the comparative analysis of an increasingly crucial area of economic law.